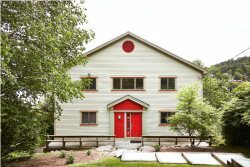 Come stay at this spacacious, centrally located property on beautiful Lake Sunapee. With 3+ bedrooms, 4 baths, 2 living rooms and more, your visit here will not disappoint! Entering the home you will find yourself in the large kitchen, equipped with a center island, and full appliances. There is plenty of counter space, cookware, and easy access to the deck area and gas grill. The dining room table seats 6-8 and is also near the deck where you will find more seating with gorgeous lake views. The main level of the house has an open concept kitchen/living/dining area, perfect for large groups or hosting gatherings. The living room has a wood burning fireplace, TV, sofa and chairs, as well as a wet bar. Off the kitchen on the main floor is a bedroom with a queen and twin bed, its own TV, and air conditioner. There is also a full bathroom for easy access on this level. Apon entering the upper level you will find a landing area with a double futon for extra sleeping accommodations. Each bedroom in the house is equipped with its own TV and air conditioner for maximum comfort in the summer months. Continuing across the landing you will find a roomy master suite with a king bed, private bathroom, and access to a balcony with beatiful lake views. Across the landing is another bedroom with a queen and twin bed, a private bath with a shower, and access to an identical private balcony. The lower/walk out level of the house has a two car garage, a family room with sectional sofa and flat screen TV and sliding glass doors out to the waterfront and front yard. The lower level also has a queen bed with its own full bath, tucked just around the corner from the woodstove. The house is equipped with Wi-Fi, Cable TV, heating and air conditioning. The yard is grassy, well landscaped, and leads to the dock where you can easily access the water. Located next door to Dewey Beach you will have a pass that allows you to the use of its amenities which include free access to canoes, kayaks, sail boats and more.